How Wonderful to be Centrally Isolated! Here at Fairmont, I write a weekly column for the Times West Virginian newspaper. 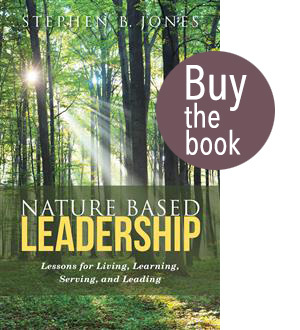 I offer perspective from my Interim Presidency, and frequently weave a Nature-Inspired Learning and Leading thread into the fabric. The essay/column below will appear sometime in September. Judy and I drove to Cranberry, PA Labor Day Friday to visit our son and his family (three grands! ), leaving campus here at 3:30PM. Routine wait-time at Fairmont intersections, a little traffic through Morgantown, WV, then gridlock from Canonsburg, PA north. I suppose time-of-day and holiday flow combined to clog I-79. Our leisurely (but not at all relaxing) 15 mph pace, predictable for a metropolitan area (Pittsburgh MSMA, 2017) home to 2.36 million, reminded me that we are blessed in The Friendly City to be so centrally isolated – my Fairmont descriptor, which I’ll explain. We’re within 100 miles of Pittsburgh and its airport, shopping, entertainment, professional sports franchises, Three Rivers, and globally recognized identity as a recovered and now emergent city. A little more than three hours from Columbus, OH; under four hours to our Nation’s Capital; a bit over two hours to our state capital. Central, yes — but isolated? You bet, and that’s a good thing! Isolated from persistent gridlock, stagnant city air, Presidential motorcades (D.C.), game day traffic, and the constant cacophony of life among the masses. Sure, we have our issues, but to a far lesser extent. Deeper, natural isolation is within easy reach. The nearby rails-to-trails; Prickett’s Fort; Valley Falls; rivers rich with fish, escape, and beauty! A little further and you’re in absolute eastern USA grandeur – my heaven-on-Earth, Dolly Sods and the high plateau region above 4,000 feet! Isolated is a wonderful attribute. Over the years, business has taken me to Los Angeles – try seeking isolation there. Forgetta-bout-it! You can have the Santa Monica Freeway. Give me our lovely Connector – from the Interstate to downtown, three minutes of splendor. And think about our Interstate – what a Godsend to have it and its hi-tech corridor at our doorstep! The strength of a booming light industrial and technological sector right here in our rural midst. Add in our Harrison County neighbors and we have tremendous potential for increasing economic vibrancy and quality-of-life vitality. Oh yes, don’t forget our incredible higher education attributes – FSU and Pierpont – here to feed and fuel the corridor, our Friendly City, and the region! Again, Fairmont and environs are blessed. Perhaps it takes a short-term visitor to see the obvious. I have come to conclude generally, and in every place I’ve resided, that far too few people even look, much less see what lies around us. We are blinded by familiarity; dulled by our digital devices; and distracted by routine. Fresh eyes and my imposed urgency to make a difference here at FSU force me to look, see, and feel deeply, prompting me to act – on behalf of FSU… and the community we inhabit. My big question: are we at FSU capitalizing on what I view as strategic comparative advantages? Do we adequately incorporate these attributes into our image, brand, and identity? Are we even seeing, much less capitalizing on, the possibilities? Not when I arrived. Instead, we bemoaned declining WV high school demographics, reduced State support of higher education, and our trailing WV economic stature. I’ve said repeatedly, shed that self-fulfilling mindset. Rise above it. Ride the wave spurred by our special advantages. Build those positives into our identity. Forge powerful reciprocal partnerships with our robust business and industry neighbors along the corridor. Attract students from outside West Virginia, the region, and the US. Jettison the lethargy of an institution staking its future on Charleston alone. Don’t await the cavalry arriving from Kanawha County to save us – it does not exist, nor will it. Our fate is in our own hands. I intend to pass the baton to FSU’s next President, having charted a course forward, upward, and onward. We (FSU and our region) are positioned for advance… and for sustainable success. I am grateful for the chance to play some small role in securing the future. The column ends there. I had no trouble adopting it to my Great Blue Heron Blog theme of Nature-Inspired Learning and Leading. My Interim Presidency is, in every sense, an extension of my work at Great Blue Heron. I am applying my GBH trade and model to an annual $45 million-dollar enterprise. This trial is proving wildly successful. Employing my ecosystem approach to enterprise management is working beautifully. After my FSU term, what follows? Another interim gig in higher education, at an NGO, a business? Perhaps a series of contracts to write Forestland Legacy Stories? Maybe a third book — a compendium of these GBH Posts? This Interim Presidency has buoyed my look to what lies ahead. I am having the time of my life — lifting a university of 4,000 future citizens, 30,000 alumni, and a major cog in the regional economy! Operating from an environmental base that aligns with my heritage… and my destiny. Life is Good! Featured Image: Fog envelops the Monongahela River Valley several hundred feet below and south of campus. September 4, the cooler mornings with associated fog portends autumn. http://stevejonesgbh.com/wp-content/uploads/2017/09/IMG_3978Early-September-River-Fog.jpg 1512 2016 Steve Jones http://stevejonesgbh.com/wp-content/uploads/2017/01/gbhweblogo.png Steve Jones2017-09-05 03:34:282017-09-05 03:34:28How Wonderful to be Centrally Isolated! I carved out Sunday afternoon time to visit nearby Valley Falls State Park, August 6. 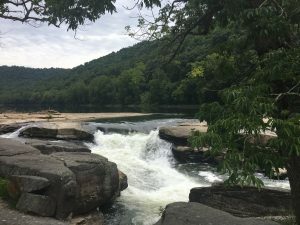 The Tygart River Falls, flush with abundant July Rains, provided a great setting to begin and end my four miles through the more-than-century-old second growth forest. The Park’s 1,145-acres once supported a community dependent upon the site’s lumber and grist mill, first operated in 1827, and now long-since consumed by dis-use, decay, fire, and flood. Little direct evidence remains. The forest is even-aged, naturally regenerated following extensive, and perhaps multiple clear-cuttings supplying original-growth logs to the mill and then fuel-wood for residential use. I saw nary a stump, evidencing both the long period of time since the last cuttings in the late 19th or early 20th Century and that no cutting has occurred in the current stand. I saw more than a few trees in the three- to four-feet diameter range. This red oak approaches four-feet diameter at breast height (in forestry terms DBH: diameter breast height, or 4.5 feet above ground level). Many trees beyond are 12-20″ DBH. The photo below demonstrates that what otherwise might appear to be a maturing forest in stasis is, in fact, a dynamic ecosystem. The trees occupying the stand are competing aggressively for finite site resources: light, soil, moisture, and space, among others. When new growth first began claiming the clear cut forest, tens and perhaps hundreds of thousands of stems per acre fought fiercely. An eastern deciduous forest rule of thumb is that stand development results in two-percent annual mortality. Causes include disease, insects, inadequate light, wind, lightning, beaver, and many others. 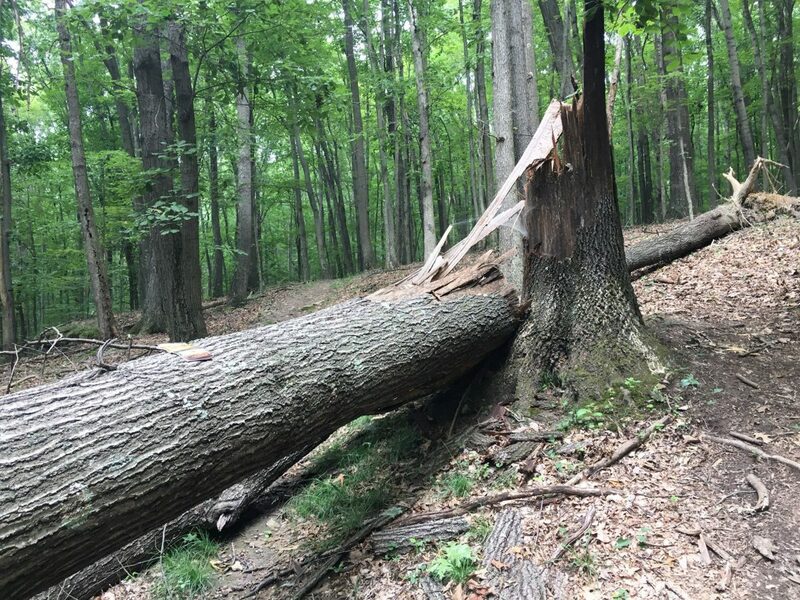 The feature-photo red oaks, both about two-feet DBH, wind up-rooted one, striking the crown of the other domino-style as it fell, snapping the second at ground level, in a strong straight-line burst, likely during a thunderstorm. The two 90-100-foot stems lie within two degrees of parallel. So much for stasis in a dynamic forest. Because nature truly does abhor a vacuum, seedlings will soon fill the sunlit forest floor under the large canopy opening. Wind is not the only agent of change. Most mortality is more subtle, inexorable. 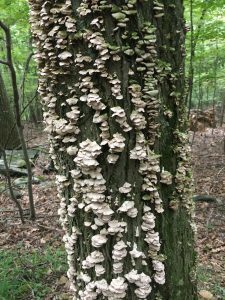 This 10″ DBH hickory could not keep apace with its neighbors, slowly losing prime access to light and other essential resources… weakening, unable to fend off the unrelenting forces of insect, disease, and poor resource consumption. The saprophytic fungal fruiting bodies are a sign of death, not an agent of demise. Their parent mycelia are feasting on the vertical cellulose buffet. 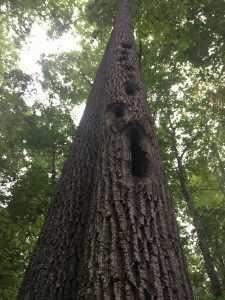 In time, the hickory will yield to gravity, returning its remaining lignin to the forest floor, from where successor trees will once again take it vertical. Again, nothing in nature is permanent. This dead, until-recently-standing red oak (18″ DBH) has crossed the strength threshold for balancing the above ground mass. An adjacent crown has temporarily halted its slip to full horizontal. Gravity always prevails, and this stem, too, will soon fall to the ground, where it will decay into the soil and, as all living matter does, recycle once more into the living. The forest tells many tales. A four-mile hike can spin a century of life… and death, for those able to read its language. For those who look, see, feel, and interpret. This old sentinel probably predates the even-aged stand. Its large girth and course crown (mostly dropped) evidences that it grew open for some time, perhaps shading an early residence along the road that is now the trail. Maybe it provided some welcome shade at a concentration area where laborers placed wood on skids for transport to the mill or community. If only it could relate its story. Had I dallied longer at this milepost along my own route, I might have read more from the land. My journey was quick; the forest’s sojourn covers well over a century. Note the human nature touch on the adjacent beech tree. I did not notice the carving of initials and date until I viewed the photo at home. I walked alone; perhaps a couple had passed hand-in-hand, and left the mark of their feelings? 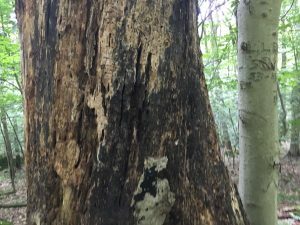 Even this healthy, full-crowned, dominant yellow poplar shows a scar or two. These now-healing wood pecker excavations have left a physical mark, opened a court to fungal invasion, and may one day lead to stem failure. Why this tree? Why here along this stem? What tasty morsel attracted the pileated woodpecker? 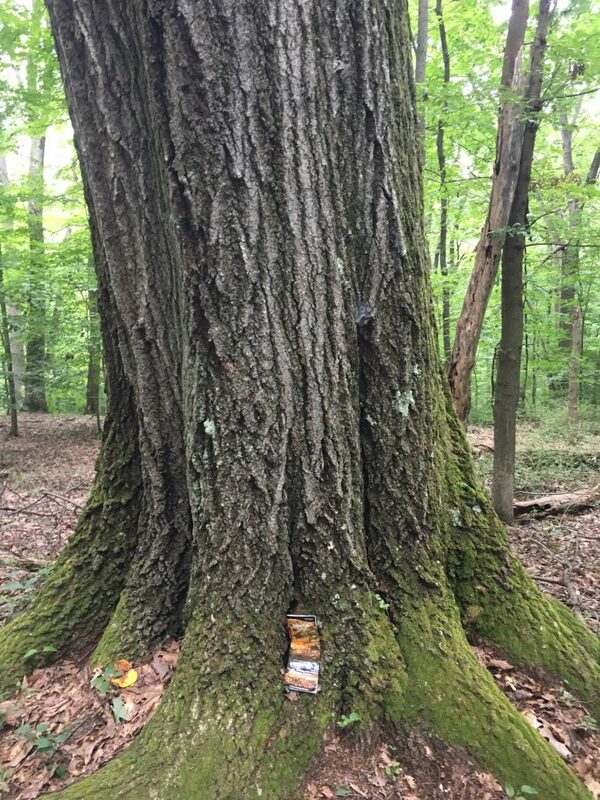 I show it here only as evidence that nothing in nature is static — not even for this magnificent yellow poplar, reaching 110 feet above its 36″ DBH trunk. I also include it here because it evokes an image of that brilliant soldier of the forest pounding for insects on a late spring morning, resounding and echoing across the wooded hills, perhaps reaching the river below. I ended my hike back at the river, above the old mill race. These waters will still flow long after that poplar returns to the forest floor, decays, and is recycled through ten thousand more such forest fauna and flora. Nature is restless and relentless. Her lessons are persistent and powerful. I conclude a powerful lesson from my hike: nothing about your business, enterprise, or life is permanent. Don’t count on anything to remain at stasis. Change is inexorable, occasionally predictable, sometimes not. Gravity and the passage of time are certain and reliable; little else is. To the extent you are able and willing, open your eyes to the world around you, and learn from it. 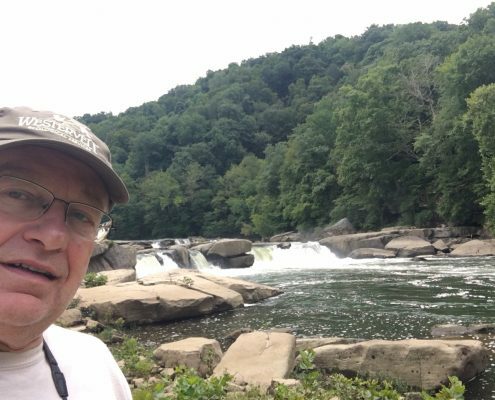 I am taking the equivalent of a hiking tour of Fairmont State University, where I am a month-and-a-half into my six-month interim presidency. I am reading from the historic and present landscape its story of people, potential, place, and promise… and translating what I see, through a set of generated feelings and deep experiences, to recommendations for action and implementation. GBH can do the same for your enterprise or organization. My four-mile Valley Falls hike yielded a micro Forestland Legacy Story. Just think what we might develop from a full day or two on your property, weaving Nature’s tale with the threads of your ownership into a fabric rich with sentiment, memories, family, and nature. A story that, like the waters of the Tygart River, will flow into the distant future, touching descendants centuries hence. Featured Photo: Everything is static… without the passage of time; stasis does not exist in Nature! We had watched the Canada Goose pair along our near-east shore for more than a month. First, they began frequenting the stretch of shoreline, seeming to stake claim. One of the two aggressively chased away intruders. Next, they scratched and prepared a nest 2-3 feet from water’s edge. April 7, we saw the female at dawn sitting on the nest. The male sat remote from the nest, 150 feet south. Pity the hapless male (we think he showed aggression only to other males) who wandered within the zone he intended to protect. He would honk angrily (it seemed angry to us – his actions demonstrated fierceness), launch horizontally and on occasion leap upon the interloper. He would, when possible, grasp the offending bird’s tail with his beak, and attempt pulling that bird under water. In all cases that we witnessed, the other bird’s primary action was flight (as in flight or fight). Not once did we see the trespassing culprit stand up to the fury. Even when the male dunked the other, that bird managed to emerge and escape, apparently unscathed. When the angry bird pursued in the water, he displayed his pique with hoarse honking and head extended, neck parallel to and just inches above the water, appearing snake-like. Others quickly surmised that this guy was serious. We knew immediately at first light two weeks after the female began nest-sitting, that something was not right. The pair sat together where the male had steadfastly stood guard. I observed to Judy, “Something is wrong. They look sad.” As we gained light, I looked at the nest through binoculars. Sure enough, egg shells and feathers marked the nest vicinity. The two stayed close through the next couple of days, she remained stationary that entire first day. The second day, she walked with a pronounced limp, but seemed otherwise okay. She had obviously suffered some injury in defending the clutch. What predator? The overnight possibilities include coyote, skunk, raccoon, and snapping turtle. The coyotes have not been emboldened enough to venture into the open parts of our neighborhood, preferring to stick to adjoining woods and fields. Nor have I seen raccoons, yet I imagine they are nearby. I have detected skunk scent, but have not seen one near our lake. However, we’ve frequently seen two big snappers on our end of the lake; fifteen inches in diameter or more with large heads. Big enough to handle a goose. Stealthy enough to ease from the water and do his work before the goose could alarm the gander. I’m sticking with the turtle attribution. April 21, 2017 – both a sad day for our goose neighbors, and a day of celebration for a mallard pair. We had not spotted their nest nor witnessed any courtship or family planning and preparation. Within an hour of spotting our forlorn goose pair, we saw a female mallard emerging from water grasses along the west shore, with a string of tiny ducklings trailing… and papa following behind. Even with the binoculars I could not make a head count, guessing at least ten. Within a couple of days, our next-door neighbors made a confirmed count of 13. As the mallard family approached the heart-sick goose couple, we ached for their loss. What did they feel? We can only speculate. They certainly projected a sense of loss. As I write this essay, the ducklings are in their sixth week, 70 percent of mama’s size. The count has been steady at ten for the past month. Three lost to who knows what end – predation, illness, poor swimming? They are more than halfway to fledging. They run remarkably fast when, while they forage under our feeders, one of us emerges and mama urges a dash to the water. We’ve seen her signal alarm as they swim in tight formation. Their response is immediate, furiously paddling and flapping their still miniature wings. Again, surprisingly rapid. Now back to the goose pair. The female stopped limping within a week. Even during her period of hobbling, she could fly. To our dismay, the male did not cease his aggressive territoriality and now phantom-nest protection. The couple stays in the vicinity of his nesting guard post. Any male who happens near bears the brunt of the gosling-denied gander’s residual fury. He hasn’t missed a beat, still maniacally attacking interlopers – always just one of a pair – we suppose the male. How long will he persist in guarding and protecting? He seems somehow comfortable as the Big Blue Lake Bully. Another goose pair, who nested on the southwest shore, fared better. Mom and her five goslings presented themselves at our feeders May 4, two weeks after the fateful night. Those five are now quite large, visiting occasionally. Other nesting birds grace our meager one-third acre. Two shrub willows shore-side on our lot sport new red wing blackbird nests. A kill deer couple is incubating four eggs just fifteen feet from our patio, perched on a mounded bed where we planted a fringed-leaf Japanese maple mid-spring. They chastise us every time we venture their way. They treat us to frequent broken-wing diversionary displays! Lakeside life for us is quite rewarding, offering surprises day after day. Most are pleasant, despite the occasional setback, including the goose egg predation. Yet Nature is like that, as is life and vocation generally. No individual or enterprise operates with only tail winds and smooth sailing. Breezes shift, gales rise, and ill winds blow. We should take heed that Nature prepares for contingencies. There is a reason that just one killdeer pair tends four eggs, and will likely follow with another brood this summer. That two geese are raising five goslings and a mallard couple starting with thirteen ducklings, now tends ten adolescents (they remind me of awkward teenagers). Nature instructs us to consider risks, understand the potential consequences, and prepare for head winds and undercurrents. Also, and this point is paramount, Nature affords far more than lessons and truths. Nature INSPIRES, via both triumph and tragedy – if only we remain alert to what Nature reveals. I eagerly anticipate a gift of revelation, beauty, awe, magic, and wonder every time we walk out the door into our very suburban and undeniably domesticated yard sitting above Big Blue Lake. Life’s journey has immersed me in all levels of wildness, from Denali National Park to the Sipsey Wilderness on Alabama’s Bankhead National Forest. Two other of my favorites places that generate absolute Natural exhilaration are the Tetons and West Virginia’s Dolly Sods Wilderness. All four places reside within memory’s reach, available upon command. Big Blue Lake lies within literal reach. It, too, is rich with Nature. I urge my clients and readers to develop memories, but to not reside entirely in those recalled mental images and stored sensations. Find sources of Nature’s inspiration within physical and temporal reach. Touch the world around you… nearby; find comfort and solace at-hand. Commit to fulfilling your obligation to steward this One Earth upon which you and humanity are totally dependent. Change your life, your enterprise, and some small corner of this Earth for the better… by wisdom, knowledge, and hard work. Featured Image: Our two grieving parents. Great Blue Heron, LLC is both vocation and avocation for me, a soon-to-be-66-year-old forester, naturalist, and semi-retired university president. I write these blogs from the heart, especially this one. If you are averse to sentimentality, deep emotion, spirituality, and remarkable lessons from nature and family, stop now. If you have (or had) a mother and she, in large or small part, shaped who you are, then you may care to continue reading. Note: The photo is me at age six with Mom and Dad. Mom passed peacefully yesterday pre-dawn as she slept, just five hours after Easter. We had said our goodbyes, mine moist with tears, just two weeks earlier. I handed her the essay below the last day of our visit. After Mom heard my eulogies for Dad and for Judy’s Mom, she asked me to write hers – not upon her death, but then. She wanted to read it, rather than have me reserve it for her eventual memorial service. I took that as her positive reaction to what I had said in remembrance of Dad and Zola. Flattering as her request may have been, however, I refused to write hers in advance, not wanting to implicitly sanction some kind of premature release – a jinx. What if I wrote it and something happened to her? I did not want culpability for Mom’s premature passing! Time has advanced. As I write these words, Mom is in a nursing/rehabilitation center at age 92. She is tired (exhausted), hurting, and ill, yet she is spiritually at peace. She says emphatically that she is ready (perhaps eager) for release – to her ultimate Home. Just moments ago, she mentioned awaiting the chariot, “coming for to carry me home.” Tomorrow (4/5), Judy and I fly back to northern Alabama. I feel compelled now to write what she requested more than two decades ago. Not yet a eulogy – but certainly the makings of one. You and Dad spoon-fed nature enthusiasm into me. No, it was more like you pumped nature into me via an IV – a direct injection. You began by introducing me, through grandma Jacobs, to flowering plants – annuals like petunias, marigolds, snap dragons, four-o’clocks, cleome, and other old favorites. We collected seeds, sowed them in spring, nurtured the plantlets, and transplanted them outside. We watched the magic of germination, elongation, growth, and eventual flowering. We continued through the cycle to seed collection, and preparation for yet another growing season. You gave me plant kits – the kind where we just punched holes in the plastic cover; added water; positioned the tray on a sunny window-sill; watched the seeds sprout; and again, transplanted after danger of last frost. You both treated us to Sunday drives; picnics; camping; exposing me to Nature. Your efforts may not have consciously aimed to sculpt a naturalist – but still, you sowed the seeds. And you provided fertile soil; bright sunlight; room to grow; encouragement. Hiking, camping, fishing, hunting, and other outdoor pursuits defined my early years – and all the years since. Nature courses through my veins — and it will until my final heartbeat. You and Dad are responsible, whether your motives were intentional or not. Your love and your nurturing (and naturing) have made all the difference. Nature is a thread that weaves through the fabric of my life. Nature is a big part of who I am. Nature is core to my heart, mind, body, soul, and spirit. You and Dad spun my life’s Nature thread from the fibers of nourishing life experiences — rich with flowers, trees, forests, creeks, ponds, hills, mountains… and love. When I see a great blue heron, I view it as Dad paying a visit; expressing approval; saying hello; keeping in touch. She replied, “Either the robin or the gold finch.” “The robin because of his royal bearing and proud brown/red breast.” I can see Mom’s mind at work – the robin’s purposeful running or hopping across the lawn, ear cocked for worm noise, always ready to pounce… and extract a juicy meal. “The gold finch because of his bright color, but mostly due to his intensity of business.” I imagined Mom’s deep admiration of its rapid flittering hither and yon… and back and forth with deliberate purpose — and with seeming passion for its mission. The great blue heron will always symbolize Dad — who will live on in my heart and in the image of the magnificent water-side predator. From this day forward, Mom will be both the robin and the gold finch — and she will live in my heart — long beyond her years. I take great comfort that Mom will live on in me, and through me to our kids… and theirs… and hence. I say now, to you and Dad, thank you for giving me life; for motivating me to look; for encouraging me to see; for enabling me to understand; for helping me to truly appreciate nature’s power, wisdom, and inspiration. That is the essay I handed to Mom, and which she read in my presence. Blessedly, Mom’s chariot arrived for her yesterday morning. She had slipped more deeply each day into her passage, the transition from this physical world. During our final phone “conversation” Easter late afternoon, she was already somewhere else, “speaking” rapidly words we could not follow. Words we believe were not intended for us. We think she did not hear our voices through the phone line. During our visit two weeks ago, she occasionally communicated with those already passed. She spoke once of Dad pulling her toward him by her arm. She wanted to yield… to join him. By Easter Sunday, Mom often enjoyed “conversations” with her siblings (all preceded her in death) and her parents. This morning we watched two robins forage in our perennial beds – the first time that we’ve seen more than one here. Twenty minutes later, as a shower approached from the southwest, our resident great blue heron flew from east to west just fifty feet above the lake along our shoreline. He could not have flown nearer. I’m sure he glanced our way. Shortly after, the rain poured, nourishing all that is alive and flourishing. I feel a great sense of relief, peace, and calm. Mom and Dad have signaled that all is well. Joy fills my heart… my soul… my spirit. They both have a Home in Glory Land – that outshines the sun! Nearby Wheeler National Wildlife Refuge inspires living, learning, serving, and leading. Accustomed to living places where local birds spend winter far to our south, we are pleased now that some choose to join us for the cold months. The Wheeler Wildlife Refuge Association (http://www.friendsofwheelerrefuge.org/) April quarterly newsletter reported that Wheeler provided winter habitat for 19,000 sandhill cranes December through February. We visited often, marveling at their beauty in-flight and on-ground, enjoying the symphony of their joined voices, and feeling their spirit rise within us. The cranes left Wheeler before the end of February. All is relatively quiet there now and will remain so until the they begin to return mid-November. Only a few of my neighbors know about Wheeler; even fewer have visited. Although the cranes wintering here is a gift from God (enabled by the intrepid conservationists who helped envision and create the Refuge), far too many people are ignorant of the annual three-month miracle along the Tennessee river. A January day at Wheeler (photo) instructs us to truly open our eyes – to actually look, see, feel, and act on behalf of our future. Nature’s inspiration is a powerful force… an elixir, a tonic that can soothe and lift. Nature’s wisdom runs deep, tested across the eons. Too many of us, tragically, are blind to Nature’s magic, wonder, awe, and beauty. Nearly none of us recognize that we are integral to Nature’s ebbs, flows, patterns, and processes. We are all subject to the seasons of life. We can all learn from the way sandhill cranes flourish across conditions, time, and geography. Great Blue Heron, LLC (stevejonesGBH.com) helps open eyes to Nature’s wisdom and inspiration, and apply Nature’s lessons to our lives and enterprises. What a pleasure to meet with like-minded professionals, experienced in international education. And what a joy to slip south more deeply into spring’s inexorable advance. I am so pleased that Great Blue Heron can participate in this venture to improve international education in the western hemisphere. 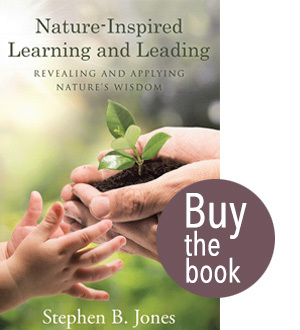 You might wonder about the connection between Nature-Inspired Learning & Leading and international education. The explanation is simple – allow me. Our Earth is an isolated mote of dust in the vast darkness of space. We orbit an insignificant star on a spiral arm of the Milky Way, one of some 100 billion stars in our home galaxy. At the speed of light (186,000 miles per second), travel to the center of the Milky Way would take 25-30,000 years! Astronomers now estimate that ours is among two trillion such galaxies in the universe. Every single aspect of life and living on Earth is intimately interconnected; nothing is truly isolated on our tiny planet. Nature and Human Nature intersect in all dimensions of our fragile global community. So, whether education, politics, economic development, trade, health, or social issues, all is global. Edu-Alliance recognizes our planetary reality and is committed to improving our social, economic, and environmental well-being and human sustainability through education. We believe we are fulfilling a fundamental imperative for the common future good. Edu-Alliance has a three-year performance track record, improving international education in the Middle-East and Northern Africa. What better time than now, with a new US Administration in-place, for introducing Edu-Alliance to North America. Our intent as a core Advisory Council is to help education administrators, governmental entities, industry, and the NGO community navigate the international education arena during this period of absolute need and transition. Nature handles transitions from the basis of a few billion years of evolved wisdom, a little ongoing trial and error, and the basic laws of physics. Nature instructs that perturbations constitute the norm. Nature and Human Nature have handled far more serious “disturbances” than this election emplacing a new Administration unfamiliar with the ways of “doing things in Washington.” I view the situation as more an opportunity than a threat to higher education. Let’s advantage the moment to make things better – it is Nature’s way to seize opportunity. Our country, as has Nature across the vast sweep of time, optimizes in response to change. We in the US have invested 250 years in improving America by attracting and welcoming the world’s best and brightest, those entrants seeking asylum, opportunity, and an education in our Homeland. Likewise, our American students are strengthened by access to opportunities abroad to learn, work, and visit. I am convinced that the new Administration seeks that as well. Edu-Alliance (and Great Blue Heron, LLC) can assist achieving those ends through initiatives in furtherance of international education. It is only Natural that we help find advantage in the moment. An informed, educated global citizenry is part of our collective solution to Earth Stewardship and global sustainability! A moisture-rich SSW feed from the Gulf of Mexico and an embedded disturbance delivered 1.2 inches from late morning through early afternoon today. Tropical showers with rumbles of thunder entertained us from time to time. Our lake is now at full pool, a good three to four feet higher than the disturbingly low level that persisted during the late summer through mid-November, when dormant season rains began in earnest. Since those first welcome soaking rains, I’ve measured 20.9 inches, a bit above the long term average of ~18 inches for the period. Our northern Alabama relief has come with only one or two episodes of what I’ll refer to as excess rainfall. That is, rainfall rates and amounts sufficient to trigger flash flood statements and actual damage, albeit limited. In contrast, California’s drought-busting storms have triggered extensive flooding. We have been blessed with relief generally without negative consequence. I am pleased to see area streams at seasonal flow, ground water recharging, and the stage set for the growing season ahead. Nature’s abundance lifts my spirits and improves my outlook. Although I do not fully comprehend all of the NWS lingo, I am a lay student of meteorology and can appreciate that these parameters set the stage for some rough weather. I will stay tuned and remain attentive as the situation develops tomorrow. Nature fascinates me. We live on a planet with a dynamic atmosphere, its Troposphere churning and stirring constantly. We are entering a season typified by battling air masses here in the Southeast. Summer will win the war, yet fierce battles will be staged as winter thrusts its cold air south time and again between now and early May. Tomorrow will not be the last time battle lines are drawn across northern Alabama. I will enjoy watching the drama unfold, ever-conscious that there can be real casualties. Ever-aware of the need to seek shelter if necessary. Nature frequently humbles and inspires. Nature is an exquisite teacher. A day does not go by that I do not learn yet a little more by observing her patterns and processes. Potentially severe and damaging conditions and circumstances buffet our lives and enterprises occasionally. We deal with and react to them effectively only when we understand, and especially when we anticipate and prepare in advance. Great Blue Heron urges individuals and enterprises to learn from Nature even as she Inspires all that we do. February 15, we returned to nearby Wheeler National Wildlife Refuge. Some three weeks had passed since our last trip. From mid-December through late January, visits rewarded us with thousands of sandhill cranes — feeding, dancing, cavorting, rattling, and bugling across the flats near the observation center. The center’s external microphones captured their cacophonous joy; speakers brought their celebrations indoors. What better place for the cranes to vacation than along a Tennessee River Valley refuge at 34.7 degrees North Latitude, while winter blasted their far northern breeding grounds! We particularly enjoyed their comings and goings, streaming in continuously during the morning in ragged flights ranging from the occasional single to crowds of fifty-plus. Always approaching at 100-300 feet, swinging around to face the wind, and sailing with wings spread, sometimes with strong breezes, seeming stationary to the ground, slowly descending, with landing gears at the ready. An amazing display as they adjusted wing flaps and landed flawlessly upright. Discussion among those arriving and their cohorts on the ground rising to crescendo with each incoming group. Because night predators would have easy access to cranes standing on upland fields, an hour or so before winter sunset brought high-level activity to the feeding grounds. Over the course of an incredible half-hour, first one and then many groups lifted with great ceremony, wheeling hither and yon, gathering, forming once again into loose formation, yakking incessantly, and generally heading east not far above tree top level. Many groups circled; some headed immediately east; and others flew east, returned, and then eventually flew east to the shallow, flooded flats where they found overnight safety. A daily social activity that expressed joy and love of life. Were the sandhills the only Wheeler peak season feature, that would have been reward enough. Add in five to a high of 13 whooping cranes that we spotted, and explode the thrill and pleasure. Thank God we have tracked progress in saving this magnificent animal from the brink. Twice this season we marveled at a pair and their single immature offspring, still staying close to mom and dad. Again, peak season covered the open water with many thousands of ducks of various species. One day in January, excitement spread among the loyal birders when we identified a pair of Asian widgeons, right there off the observation center, my first. Another day, the ducks lifted almost in unison, filling the sky, just as someone pointed out a red-tailed hawk cruising past. Last year we watched a red-tail feeding on fresh duck, ripping it apart from a perch on a strategically placed utility pole with platform. Every time I experienced Wheeler during peak season, my heart raced; my soul and spirit lifted and soared. We knew the peak season would begin to ebb as spring neared. As we drove to Wheeler this week, red maple showed nearly full flower. A violet nodded at us along the trail. We also heard several weak peeper trills. As we neared the observation center, no sandhill rattles greeted us. We saw no birds through the winter-bare hardwoods. Entering the center, we noticed water and fields generally absent birds. Along the northern shore we counted a dozen or so sandhiils. A few mallards on the water, and scores of Canada geese feeding on fresh grass sprouts. Still mid-morning, we watched a few flights of sandhills wheel in from the east, swing south and land to the north, joining the cranes already gathered there. A local birder with strong spotting scope counted 231 cranes assembled by the time we departed. Still enough to inspire awe and wonder, yet far short of the ten thousand that would be within sight during peak. I wondered, where are they? Winter is not yet in rapid retreat north of us. A red maple in flower here may suggest that the sugar maple sap is beginning to flow in southern Michigan, but reliable spring warmth trails far behind the first sap boiling. Perhaps the cranes are still nearby and were elsewhere on the refuge. I don’t think so; I’m told by those who have marked the ebbs and flows over decades that the fields are often thinly stocked by mid-February. I am delighted that we are now located permanently (no, nothing is permanent; yet we will be here until our days end), within 25 miles of this magical place, and we can chronicle the annual bird-doings ourselves. All things in life and in the seasons of our enterprises experience patterns, cycles, and shifts. Most of those we can anticipate, predict, and monitor. We can modify our behavior and responses accordingly. I truly feel sorry for those fellow citizens of the Huntsville area who do not know the magic of Wheeler. Last evening, returning home from my wife’s doctor’s appointment, approaching my turn-off, I saw a young woman driver racing past me. I glanced over to see her holding a cigarette in her left hand and focusing on the hand-held device in her right. I am certain she does not know Nature. She can’t even see the life on the road she is dangerously traversing. She is blind to the life-dimension that restores and renews me. I pray that she kills no one, including herself. I see such ignorance and ambivalence to what truly matters, and I want to do even more to awaken us — as individuals and as a society. Metaphorically, we are blind, deaf, and dumb (forgive me if I dare to say, recklessly stupid!). So many are simply not looking. So few are actually seeing. Almost none are feeling. And rare is the person who is seeing and feeling enough to act on behalf of our future. As I repeat and pound in my essays, blogs, books, speaking, and consulting, my ultimate intent through Great Blue Heron is to enhance lives and enterprise success, even as I sow the seeds for responsible Earth stewardship. Every trip I make to Wheeler, whether during peak or off-season, fuels my mission and strengthens my resolve. Still my heart races and my soul soars. This past Sunday, my nine-year-old grandson (Jack) and I visited a nearby nature preserve, our first visit to this location. Most of us conjure an image of raw, unblemished wilderness with the term “preserve.” Not so this Harvest Square Nature Preserve, an approximately 70-acre parcel donated by the developer of an adjacent commercial property. The Preserve includes two lakes totaling 17 acres. The lakes are borrow pits that furnished fill for the commercial construction. The term borrow is a bit of a misnomer – the developer removed the fill permanently. The action does not constitute borrowing. Yet I digress. Man-made as they are, the lakes are rapidly naturalizing. As we exited the car, a great blue heron rose from the larger lake’s shore and flew into the mature trees southeast of the lake. We noticed that a small creek east of the lake had recently over-flowed its west bank into the lake. Evidenced suggested that such an overflow occurrence is not rare near the active beaver dam along the creek. Small wonder the trail we traversed is named Beaver Dam Trail! Thus, critters and flora of all stripes routinely exchange between lake and stream. Cattail rushes line the east and north lake shore where the trail led us. Other wetland-related vegetation, from grasses to blackberries to young ash and willow provide human-impenetrable cover 10-15 feet tall. Small birds flitted among the late winter seed-sources. We watched a pair of mallards foraging along the west shore. We saw beaver-gnawed sapling stumps along the north shore. I could go on and on about the magic, awe, and wonder inspired and enabled by the simple act of excavating fill for a shopping center, and then having the foresight and land ethic to create a grandfather and grandson-friendly preserve. How simple… how exquisite! Yes, we can draw ultimate pleasure from the simplest of nature’s blessings. 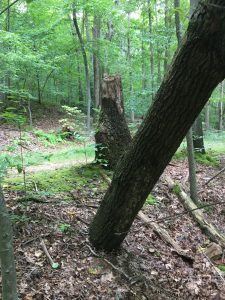 Whether fortuitously or deliberately, the developer left a stand of upland hardwoods bordering a cultivated field (33 acres still farmed under the donation agreement). The relict stand includes a few of its own mighty oaks, long-term witnesses to all that has touched this 70-acre parcel over more than a century. Grandson Jack and I covered the entire preserve. We enjoyed every moment, including accumulating loads of clayey mud as we traversed the open field (covered in last summer’s corn stubble and now sprouting winter rye), searching for arrow heads and finding none. Jack and I could not have better spent several hours. I cherished our time appreciating nature’s healing power as it transforms a borrow pit to magic, and exploring the diverse habitat encompassing just 70 acres. We both found inspiration from our venture. Parenteau described her own inspiration: “I wrote this poem many years ago when I was grieving my grandfather’s death. He was a published poet and the light of my life. I saw him as that oak tree. He was always so strong and his faith never wavered. He taught me so much about life and love and family, but most of all about Christian faith. He will be forever missed but someday I will meet him in heaven and until then this will always be my tribute to Caleb Fowler, the greatest man I ever knew.” I pray that Jack will carry his memories of me and our shared ventures forward as life unfolds for him. I urge you to find pleasure in simple things. Nature’s simple things are rich with beauty, awe, magic, and wonder. Watch for them in your life and work. Share them with the people you cherish. You will live on only through the seeds you sow. Our Alabama home sits in a development on a four-acre lake/pond. I say lake/pond because were we in Minnesota (Land of Ten Thousand Lakes) or Alaska (its number is two million! ), ours would unquestionably be a pond. Quite frankly, I prefer the image, character, and significance that the term lake conveys. The Infoplease web site offers this: “Both are small bodies of water, either natural or man-made, that are completely surrounded by land. The primary difference between the two is their size. Simply put, lakes are larger and ponds are smaller. However, there is no standardization of lake sizes.” Okay, that does it — if I call ours a lake, it’s a lake, period! Consider that a sidebar. I’m delving into something of greater philosophical merit. Something that amounts to a nature-derived lesson for living, learning, serving, and leading. Simply, what we see depends on which filters we choose to employ. Years ago, as a young forester and nature enthusiast/purist, I am sure I would have looked at our so-called lake with disdain. A four-acre farm pond, its surrounding cotton, soybean, and corn fields now having sprouted homes on three-quarter-acre lots. A development blanketed with manicured Bermuda grass and no mature vegetation, the last of the two shore-side lots with homes now fully-structured and finishing being completed inside. Were the young idealist Steve visiting a water-front resident, he would have seen only the houses, and a pond absent nature. He would have wondered why anyone would want to live in such a domesticated setting. He would have found disgust in the sterility. He would have felt an absence of nature, an affront to his sense of the natural condition as sacrosanct. He would have seen the pond as merely a catchment basin for run-off from the high density of neighborhood impermeable surfaces: roof tops, driveways, streets, and likely compacted lawns. My how we change — or should I say, “My how life changes us!” I’ve matured (some would say aged). The late Pope John XXIII’s motto is so apt: “See everything; overlook a great deal; correct a little.” Pope John also observed, “Men are like wine — some turn to vinegar, but the best improve with age.” I like to think that with respect to how I view a lake such as this, and so much of life, I have improved with age. I will elaborate. Yes, I even see the houses and some of the neighbors coming and going, yet mostly, that is what I overlook. I am convinced that Pope John did not limit his seeing to sight alone. When I urge my clients and others to look and see, I speak of seeing via all senses of experience: touch, smell, hear, and even taste. What else do we see from our patio? The list goes on. I could choose to be disturbed by the man-made distractions, yet that is mostly what I elect to screen and overlook. Life is far too short to embrace irritation rather than accept the pleasant. I can partition our lake environment to a degree where it becomes my own Golden Pond, or Walden. A related old idiom, not dissimilar to Pope John’s, cautions against not seeing the forest for the trees. I encourage my clients and readers to see the forest and the trees. A tree does not stand alone and isolated within the forest. The forest comprises a community of trees, other flora, and diverse fauna, from soil micro-organisms to the largest mammals and the tallest trees. Likewise, no enterprise or individuals stands alone. We are interconnected and interdependent. Great Blue Heron brings that knowledge and wisdom to everyone we touch, reminding all that we are part of a complex ecosystem. Even our lake is not an isolated former farm pond. This evening as I appreciated (no, relished!) a late January sunset exhaust the day, I watched geese wheel in from their day’s marauding of nearly spent fields and other water bodies. Some groups landed on our lake; others chose alternative destinations and flew past. We observed flocks of ducks look down, and then reconsider; where they alighted we know not, nor could we speculate as to why they alighted elsewhere. Our lake is a node on the web of life that ebbs and flows around us. The same is true of our individual lives and the enterprises we lead. I choose to see elements of current value to me during this period of my semi-retirement. I cherish this lake; it enriches my life. I devote far less attention to those facets that do not elevate and inspire. Interestingly, as I meet neighbors who occupy the lake-shore residences, I am dismayed by various reactions to what I see as a nearly sacred gem. I’ve heard some express deep concern that the lake attracts snakes, terrible and despicable denizens of this bit of nature. To them, all snakes near this body of water are moccasins, hell-bent on placing the residents in an early grave. Others tell us of their frustration that bullfrogs keep them awake at night. I can imagine no finer chorus! I am astounded that others do not share my enthusiasm for nature’s magic. I paid a little extra for this lakeside, ringside seat; every day, my investment returns tenfold! Pity those who see or discern no such dividend. Perhaps they view the houses and overlook the lake. What a shame. Small wonder we as a society do not share a compulsion to care for our common home. Pity those who do not embrace an Earth stewardship ethic. Great Blue Heron, LLC urges every individual and all enterprises to see the invisible; so that together we might do the impossible. My life here in northern Alabama orbits this small lake, the node of a delicate and complex ecosystem. If only others understood and appreciated how life and living for all of us rest upon knowing our place, and accepting a set of obligations and responsibilities… from our hone-place to our home-planet. The future depends upon us — all 7.5 billion of us — knowing our place and accepting our obligation. Where do you fit? How can you assist in assuring a brighter tomorrow — for you; for your enterprise; for society; for our one Earth?